Join in colour 1 and starting with 1ch, 1dc into base of 1ch, work 1dc into each dc to end, ss to first dc. Fasten off leaving a length of yarn to stitch ears to top of face. Bow - With colour 2, make 8ch, 1dc into 2nd ch from hook, 1dc into each ch to end. Turn. Starting with 1ch, 1dc into base of 1ch, work 1dc into each dc to end. Turn. 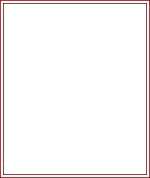 Rpt last row until 4 rows have been worked. Fasten off. Wrap colour 2 round middle of dc piece several times to make the bow. Finishing - Weave in any loose ends of yarn, stitch ears evenly to top of face (about 2tr's apart), Use small buttons for eyes, darn on nose and mouth with yarn as in picture, attach bow to bottom of face. 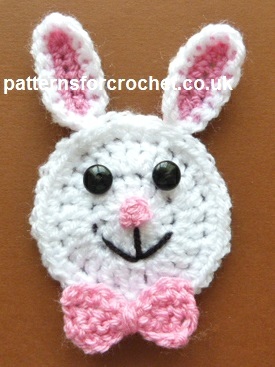 Hope you enjoy this free crochet pattern for a rabbit motif.